Corsica is blessed with a diverse and unique cuisine. Here's our guide to what to eat in Corsica. When I think of Corsican cuisine, two things immediately spring to mind - the maquis and the chestnut. The former is a unique mix of shrubs and herbs that covers much of the island and, while it differs a little around the island depending on the altitude and season, it invariably includes a heady mix of basil, juniper, mint, myrtle, oregano, thyme and a great many other fragrant flora. 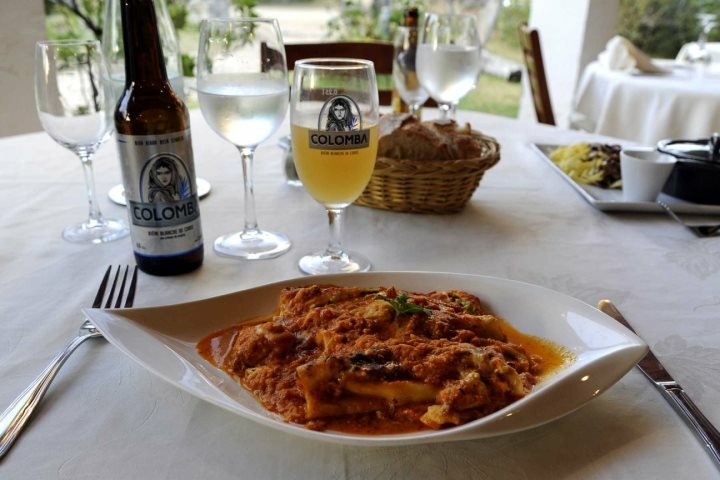 Its influence seeps into almost every aspect of the island's traditional cuisine. Whether you stay near the coast, or in Central Corsica, you'll find signs of this unique cuisine. Many of our properties enjoy superb locations that sit on the doorstep of landscapes filled with this fragrant maquis. Take a look at our range of accommodation for an idea of some of the beautiful locations you can enjoy during a stay on the island. Another major player is the humble chestnut. In the 16th century, all farmers and landowners were ordered to plant four trees every year – a sweet chestnut tree, a fig tree, a mulberry tree and an olive tree. All four of these trees are plentiful in Corsica today and free roaming wild boar and its relative, the black-skinned Nustrale pigs, gorge themselves, in particular on the chestnuts, resulting in the distinct flavour of the island’s pork products. However, the chestnut’s influence reaches much further and many traditional recipes use its flour. Chestnuts flavour everything from ice cream to liqueurs. A favourite of mine is the chestnut fig jam, delicious with a coarse Corsican pâté, some local cheese and crusty bread. Chestnuts are even used to make Corsica’s most famous beer, Pietra, not just as a flavouring but as a main ingredient. 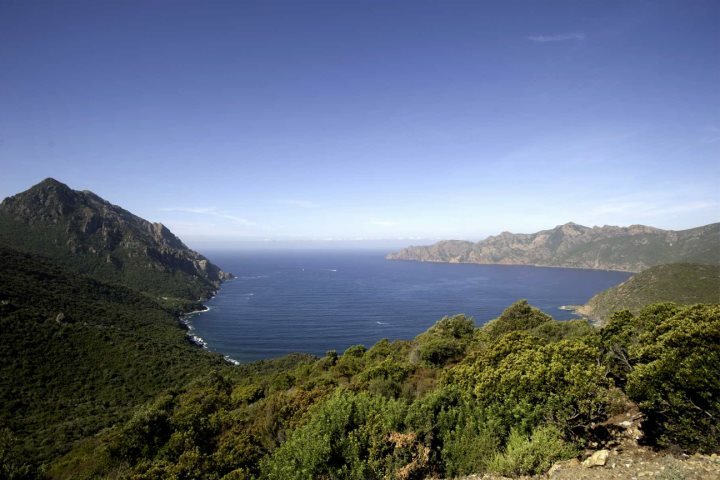 Find out more about the history of Corsica here. Have you ever driven round a bend in the road to find a herd of sheep blocking your path or having stopped the car to stretch your legs and been surrounded by wild boars? I certainly have and the latter, enticed by my sister offering one of them a biscuit, was particular unnerving. Sheep, goats, pigs, even cows and, not forgetting, the wild boar, are allowed to wander freely here. This freedom to roam, feeding on the herbs of the maquis and foraging for chestnuts, all adds up to give you some mighty fine meats. Corsican veal calves are raised alongside their mothers and grow up in a natural environment, feeding on lush grass and the shrubs of the maquis. The veal is pink-coloured rather than white, reflecting this healthy diet, and the taste is stronger. The brand Corsicarne guarantees that the animals were born, reared and slaughtered in Corsica so you know the calves have not had to endure any long distance journeys. 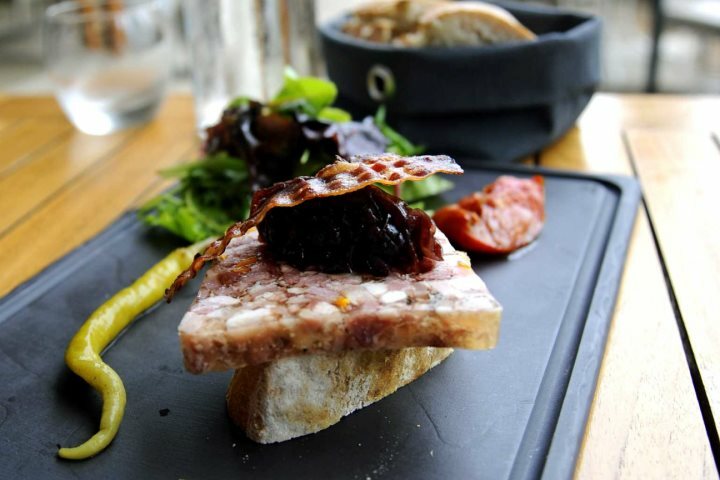 Look out for Veau aux olives – veal served with olives. 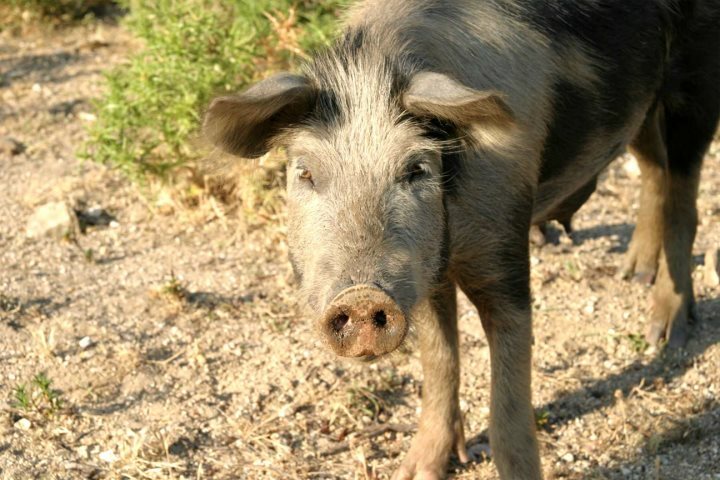 The island, however, is particularly well known for its delicious wild boar, which wander around the mountainous interior, munching on the maquis, chestnuts, figs and mulberries, giving their meat a complex flavour. Look out for Civet de Sanglier – slow cooked wild boar and chestnut stew, Corsica’s most celebrated dish. 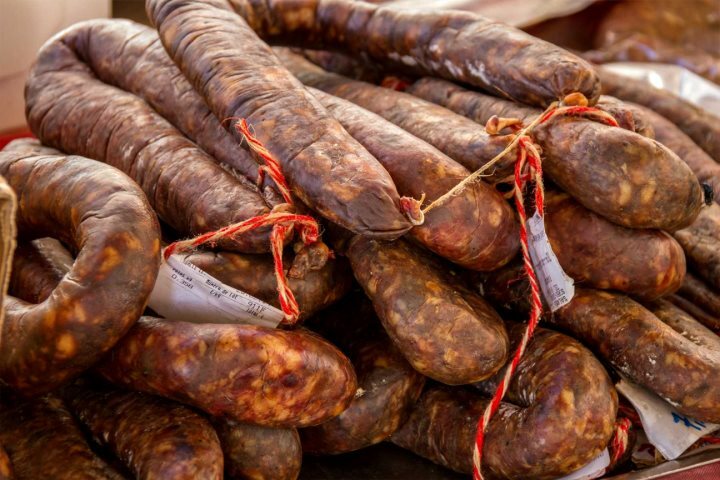 Corsica produces exceptional, richly marbled charcuterie, traditionally made using centuries-old methods such as salting, smoking, air-curing and cave-ageing, from boars and pigs fattened on chestnuts. It’s typically served as an appetiser and used in soups and stews. Look out for coppa (smoked filet), lonzu (dry-cured loin), prizuttu (dry-cured ham), figatellu (smoked liver sausage). 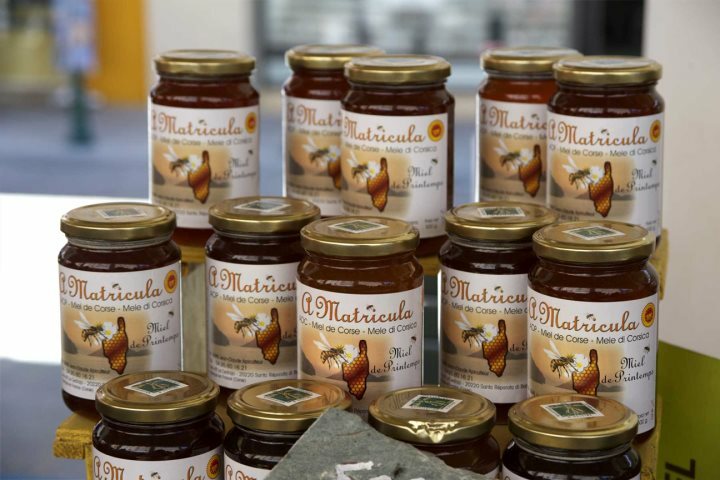 Another treat not to be missed is Corsican honey, the only honey with French AOC (appellation d'origine controlee). Hives are moved around depending on the season, producing a wonderfully varied range of honeys including maquis spring honey and a maquis autumn honey, as well as a chestnut honey, made by bees that have fed on the nectar of the summer flowering chestnut trees. 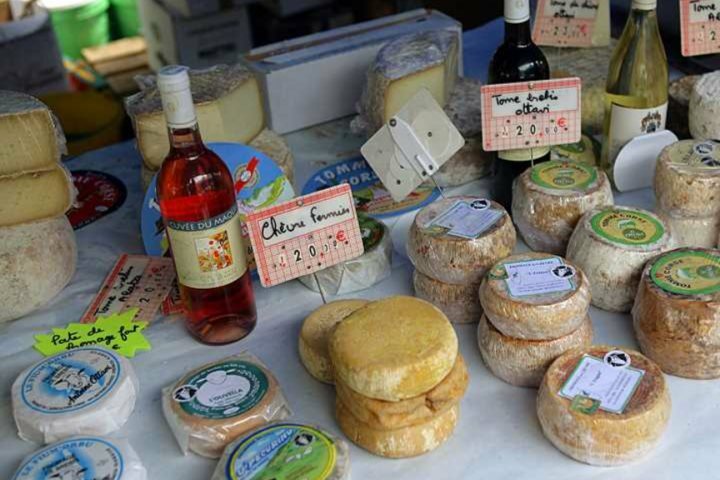 Corsican cheese is typically made from sheep‘s and goat's milk - tomme de chèvre (goat cheese) and tomme de brebis (sheep cheese). Brocciu is without doubt the most well-known. The fresh unpasteurised cheese is only available from November through to May and is a creamy, white cheese similar to ricotta. It’s used in many traditional recipes. The rest of the year an aged brocciu is enjoyed – passu (half-dry) and seccu (dry). Look out for the pasta dish Cannelloni au Brocciu and the delicious cake Fiadone. It’s also wonderful in omelettes with a little mint. Succulent seasonal fruits and vegetables are of course also put to good use. 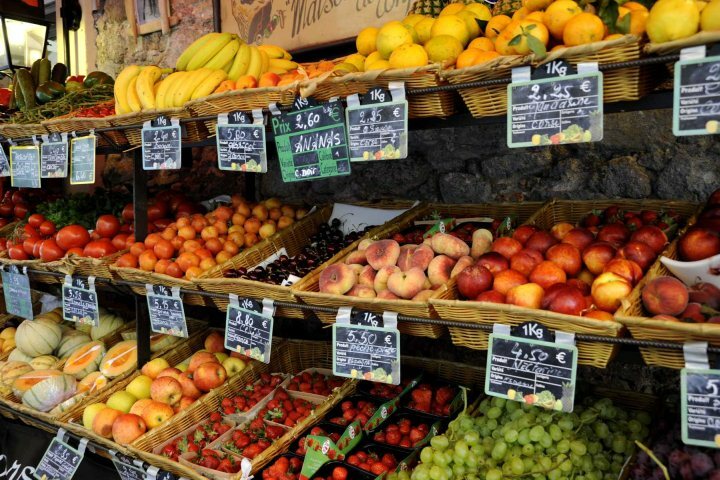 Enjoy the taste of the local fresh tomatoes, courgettes, aubergines, peaches and figs. In the autumn you’ll see the addition of wild mushroom recipes on restaurant menus. Despite being an island, historically Corsicans lived inland away from the coast to avoid invaders and the long since eradicated malaria, preferring to catch wild game than risk heading down to the shores to fish. Nowadays, the majority of islanders live a lot nearer the coast, and fish and seafood is popular. Fresh fish is so good it doesn’t need fancy sauces (en sauce) but is better enjoyed simply grilled. Keep your eyes open for the catch of the day rather than choosing from the menu. Take a look at our range of waterfront properties, ideal for gaining access to Corsica's superb seafood. 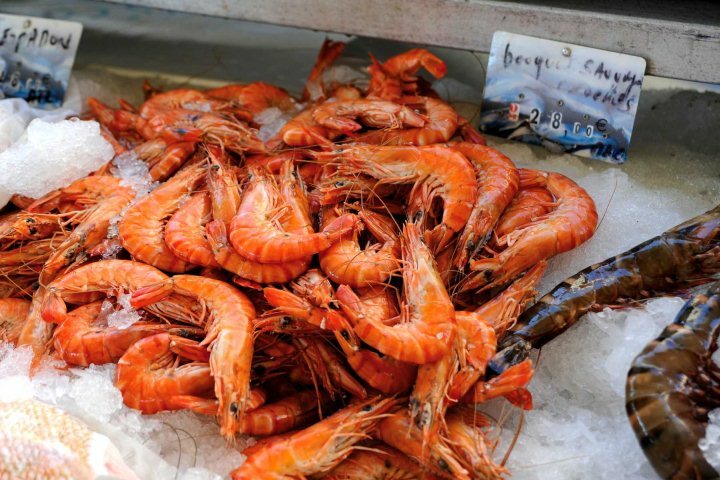 Look out for mulet (sea bass) , daurade (sea bream) , rouget (red mullet), St Pierre ( John Dorry), petite friture ( white bait), langouste (rock lobster) and oursin (sea urchin). Corsica is a wonderful destination for food lovers and, while French and Italian gastronomy have without doubt left their mark, the island’s cuisine is truly unique, thanks to the edible bounty of this very special island. Fancy experiencing these unique flavours? Check out our Holiday Ideas page for some inspiration and information for visiting the Island of Beauty.